• Explanation for Every Question you do Wrong • Top Choice! 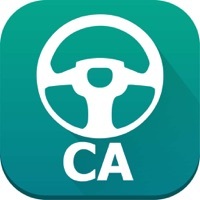 award by Appcrawlr • Featured by Apple and Google • The latest California DMV test questions are available in this app • Specific for California (generic apps can give the wrong answer from a different state) Spend only a few hours studying and pass your DMV Driving Test! 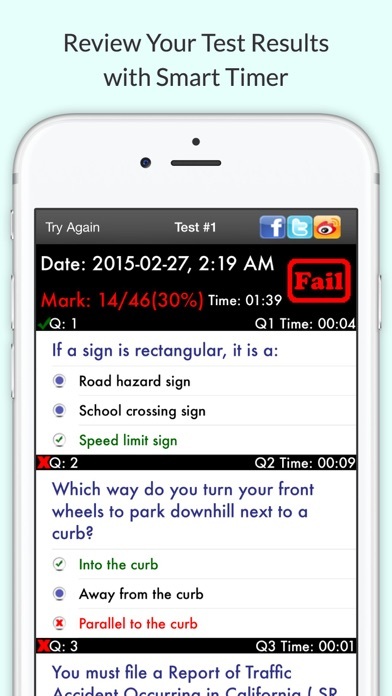 This app is professionally designed specifically for the California DMV written test. All the practice questions are based on the latest California DMV Driver's Manual. Don't waste time and money writing the California DMV permit Test again and again. 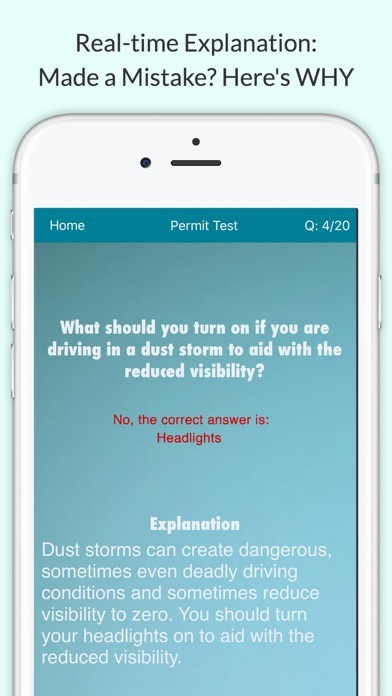 Study for your California DMV permit Test right now on your iPhone/iPod/iPad! 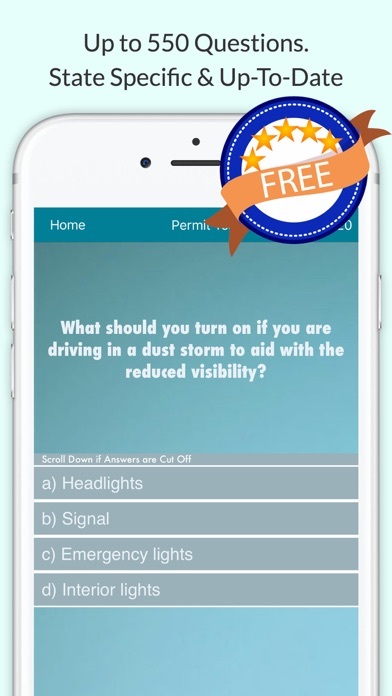 Features: • Actual California DMV test questions including 100 Traffic Signs Questions • The latest California DMV written test questions are available in this app • The questions are divided into 18 different topics, including Alcohol and Drugs, Common Signs, Lane Changes, etc • Questions in this California practice test are generated randomly • You can choose from 3 options: Random Questions, Incorrectly Answered Questions, and Not attempted Questions • You can now track how many questions you have done correctly, incorrectly, and not attempted • Option to review all the California DMV practice test questions if you don't want to take the test • Easiest way to get started on your California driver's license • Simulates a California DMV written test • This app works offline, no internet required Recommendations • Recommends when you are ready to take the permit test • Professional analysis using binomial distribution • Analyze your chances of passing the actual knowledge test based on your past performance • Gives you the probability of passing the actual knowledge test and tells you how long before closing you should go take your exam Test Result • View your test results • Find out what questions you've done wrong after taking the test • Displays the time used for each question, answer chosen and correct answer Track Past Test Results • Past test marks will be graphed so you can see your improvement • Individual tests will be listed with pass or fail and your mark • Shows your highest, average and lowest mark and time used • Explanation for every question you do wrong Support • Send feedback directly from the app • Join Facebook page • Visit our website Smart Timer • Track how long it takes for you to take this permit test • Intelligent timer will stop when you put the app to sleep or viewing the answer Track your progress • Right and wrong counter built into the test User Reviews Great app!!! ~5 Stars~ By: Lin Charles It has a clear design, it can track down ur tests in order to let u know ur process and has a graph comparison to also let u see the improvements ur having. I'd say the purchased one is good! •••••••••••••••••••••• Great DMV Preparation ~5 Stars~ By: JasonTroyHimself I'm from Chicago but have been living in California for the past 7 years. I finally decided it was time to get a California driver's license & this apps provides great study material. •••••••••••••••••••••• Great help! ~5 Stars~ By: Wulf96 Passed my test with one wrong answer on the first try! Thank you so much! •••••••••••••••••••••• How to pass California DMV Test? What questions are on the California DMV Test? If you're asking the following questions, this app is for you! Check out our partner Driving School: www.mycooldrivingschool.com *Disclaimer: This app is for general information only. Nothing in this app is intended to provide legal advice or to be relied on as binding in any dispute, claim, action, demand or proceeding. This app is completely free but you can pay to remove ads and unlock all questions immediately. Made my testing anxiety go away but it was ridiculous how many spelling errors were in these tests. There’s really no excuse to not proofread an app before it gets released. This app helps you build the knowledge necessary to ace your written test. This app is a life savior! I practiced on it for an hour with the free version. And i passed the written exam. It’s the same questions on the test! 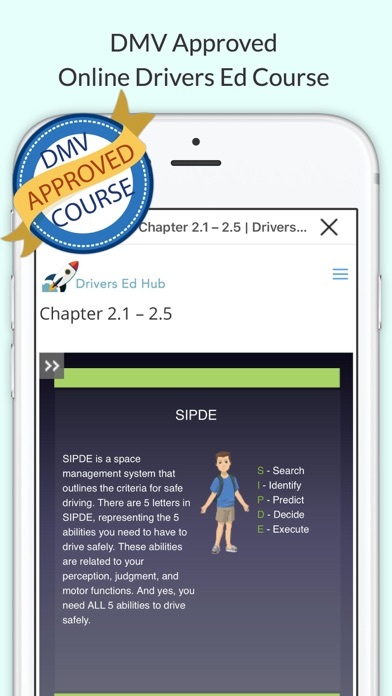 I highly recommend this app for people trying to study for their driver’s license. I even paid for the pro version to support the developers. They deserve the support for the helpful app they’ve developed for us. I just went through it a few times a day for a week. It’s really useful if you don’t have a lot of time to study! I totally recommend this app. It exceeds all the other DMV apps. It definitely will help you. Essential info here, guys. Totally recommend. I tried tapping on the tests in the app but they didn’t open. It’s a great app to use on the go. The app is overall good. 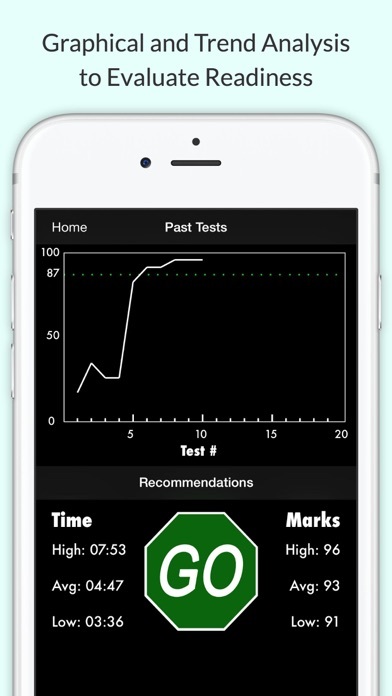 The learning curve with this app is amazing thanks to the way the tests are structured. Repeated questions from one try to another help me get the correct answers stick in my memory quickly! Great work! App is great for new test takers. 100% would recommend!!! Passed my first time taking my permit because of this app!! I recommend all my friends to this app who are taking their permit tests. Very awesome, very helpful app!! I bought this app but it won’t let us use the paid version please advise! This is very frustrating. Good app. Doesn't try to hard sell you and has a basic, easy to use interface. I'd like examples though when you get a Q. Wrong in addition to the explanation. I can’t believe an app was more useful than the book. I only had the free version for about a month and realized it had 30 repeating questions. My exam was in 2 days and I bought the app to study all the other questions. I learned about maybe 3/4 of the app and passed the written exam! If I didn’t buy the full version, I would had rescheduled my written test some other day. Total life saver!